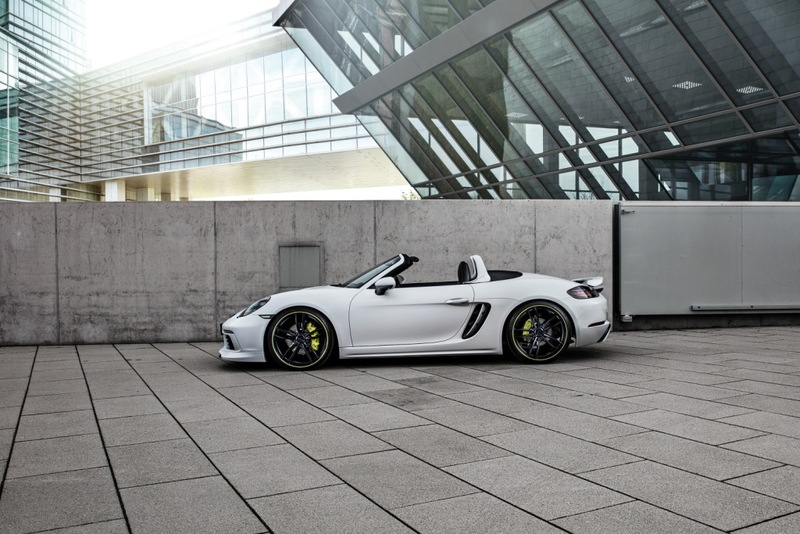 The TECHART aerokit for the new Porsche 718 Boxster and the 718 Cayman models boosts the dynamic appearance of the mid-engined sportscars. 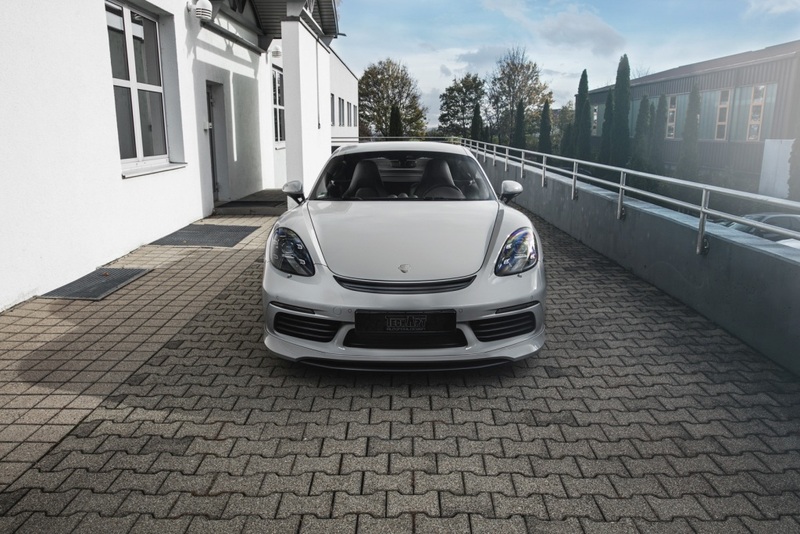 A two-piece front spoiler with integrated splitter visually extends the 718’s front view. The central air outlet helps to reduce the aerodynamic lift. Both, splitter and air outlet are optionally available in carbon fiber. 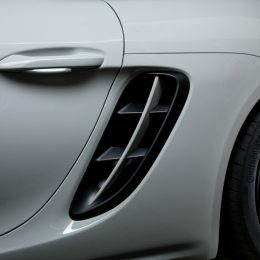 Curved fins enhance the side air intakes. 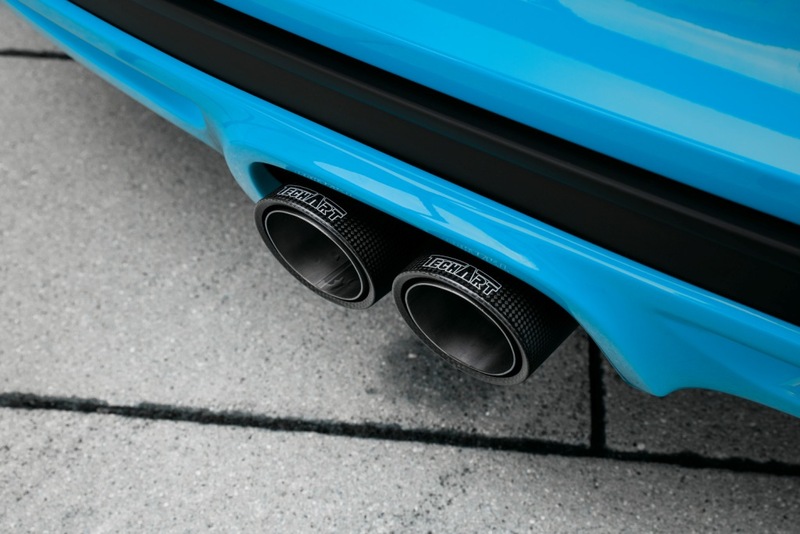 The TECHART rear diffusor surrounds the two central tailpipes. 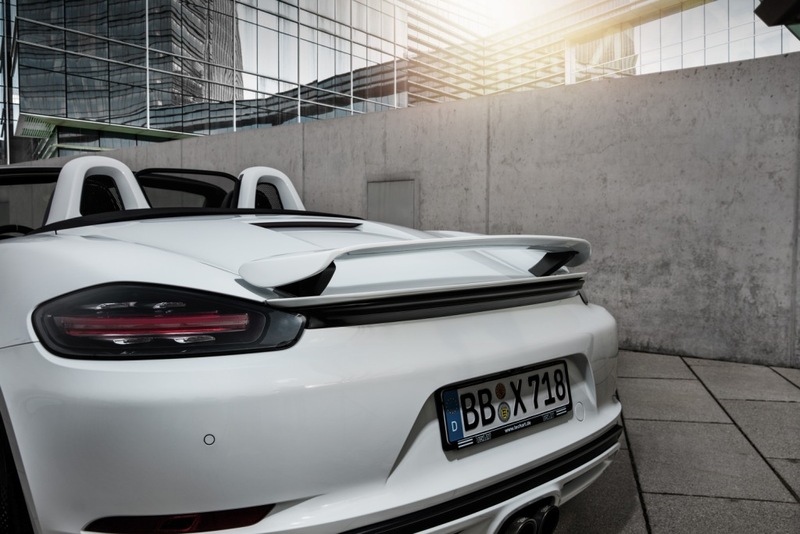 Aerodynamic highlight and design statement: the two rear spoiler variants. 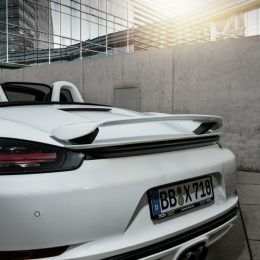 The TECHART rear spoiler I features a body colored wing profile. 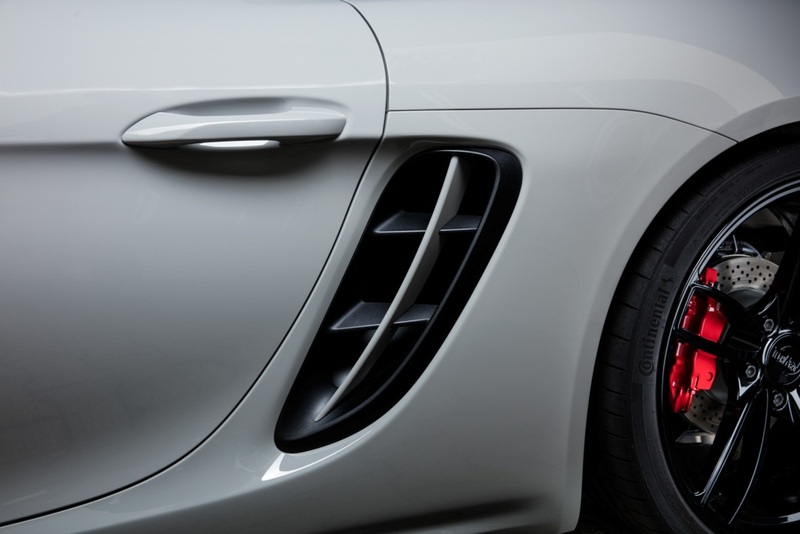 As an alternative to the rear spoiler I, the 718 Cayman can be equipped with the prominent rear spoiler II. Its motorsport styling is unmistakable. The wing profile of the rear spoiler II rests on black anodized aluminium uprights. As an option, the wing profile of the rear spoiler II is available in carbon fiber. The TECHART Carbon Fiber Sport Package. 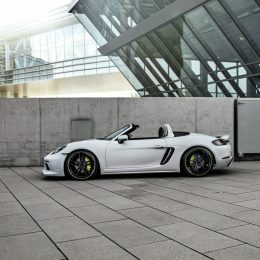 Sporty elements made of TECHART carbon fiber underlines the preference for individuality and adds unique design and character to all 718 models. Spotless carbon surfaces in matt or high gloss finish and flexible configuration options make the TECHART Carbon Sport Package the perfect choice to set sincere motor sport styling highlights. Precision-made in TECHART’s inhouse manufactory, genuine TECHART carbon fiber parts embody the freedom of personalization which is characteristic for the TECHART brand. TECHART Sport Springs, Noselift System and lightweight wheels. 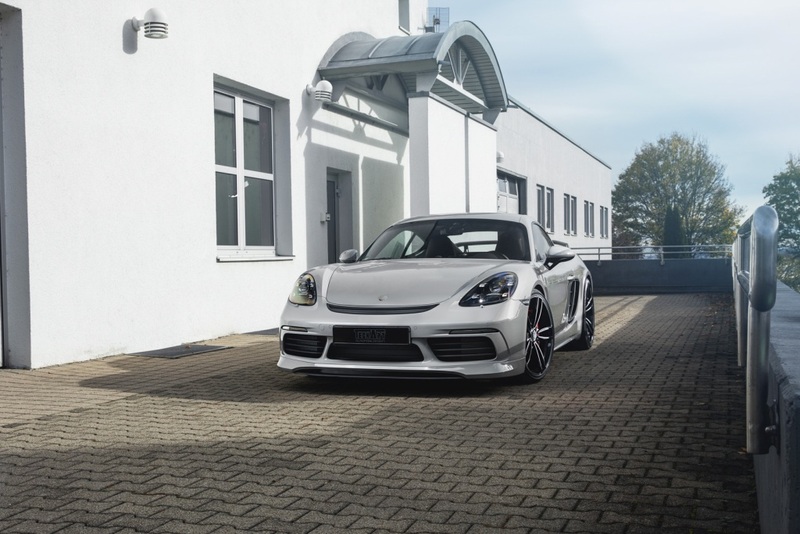 Following the sport-focused exterior, TECHART chassis and wheel options put the driving dynamics of the 718 into the spotlight. A 30 mm ride height lowering and progressively balanced TECHART sports springs provide a direct and sporty road handling. 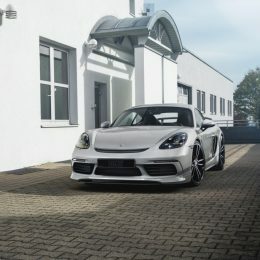 New for the 718: the renowned TECHART Noselift front axle lift system makes common obstacles such as ramps, speed humps and curbs a thing of the past. At the push of a button, the hydraulic ride-height control provides up to 60 mm of additional ground clearance at the front spoiler in order to prevent grounding. 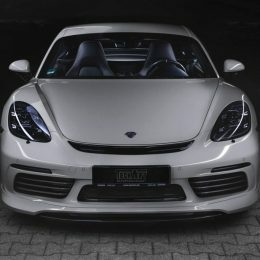 TECHART Noselift for the 718 models includes two front axle sport springs (each with main an helper springs), two rear axle sport springs, two hydraulic cylinders, hydraulic unit, installation kit and assembly instructions. 9.5J x 21 (rear). 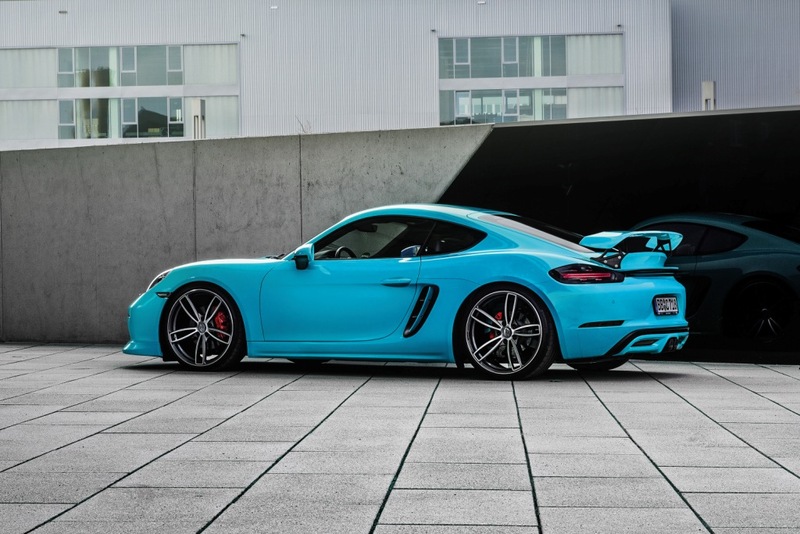 All TECHART wheels are available in individually matched custom colors. 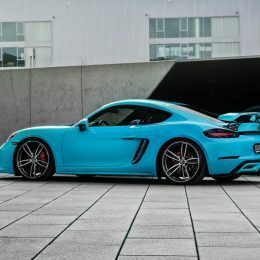 TECHART Power and Sound, whenever you’re in the mood. 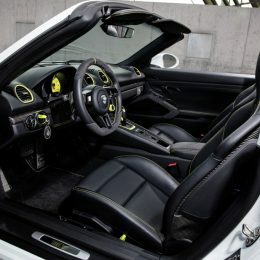 The TECHART TA 082/S1 engine enhancement increases the performance of the 2.5-liter turbocharged engine further. With the TECHTRONIC powerkit, 480 Nm of torque is delivered to the rear wheels at just 2.800 rpm (standard: 420 Nm). 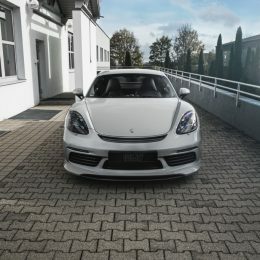 A maximum power output of 294 kW (400 hp) is available at 6,500 rpm, accelerating the 718 Boxster S and the 718 Cayman S to a top track speed of 294 km/h (standard: 257 kW (350 hp) / 285 km/h). Thus, the gap between standstill and 100 km/h shrinks to just 3.9 s, making the 2.5 l 718 models as fast as a 911 Carrera S.
The TECHART powerkit is activated automatically in SPORT and SPORT PLUS mode. 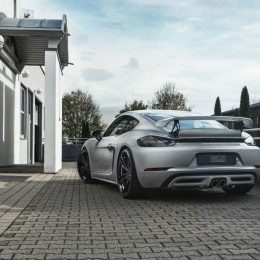 And, like in all TECHART TECHTRONIC powerkits, peace of mind is included as standard, thanks to the extensive warranty which covers engine and drivetrain. Sport Sound, composed by steel, titanium and carbon. 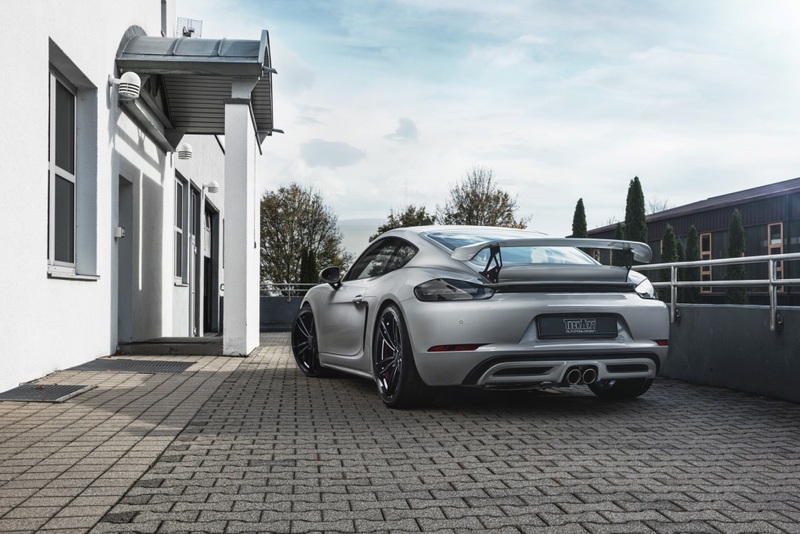 The TECHART exhaust system »Racing« creates a deep, powerful boxersound with a clear difference between “Normal“ and “Sport“ mode. Just like the powerkit, the valve exhaust is controlled with the standard SPORT Button or the optional mode switch. At standstill, two central titanium TECHART tailpipes with carbon fiber tips indicate the sporty feature. 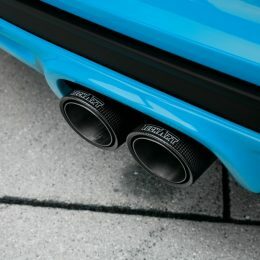 However, the TECHART exhaust system »Racing« can also be combinded with the factory tailpipes. For big or small wishes: TECHART Saddlery and Interior Manufactory. 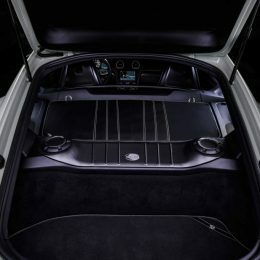 TECHART’s saddlery and leathershop transfers individual preferences into bespoke interior designs for the 718 Boxster and 718 Cayman. 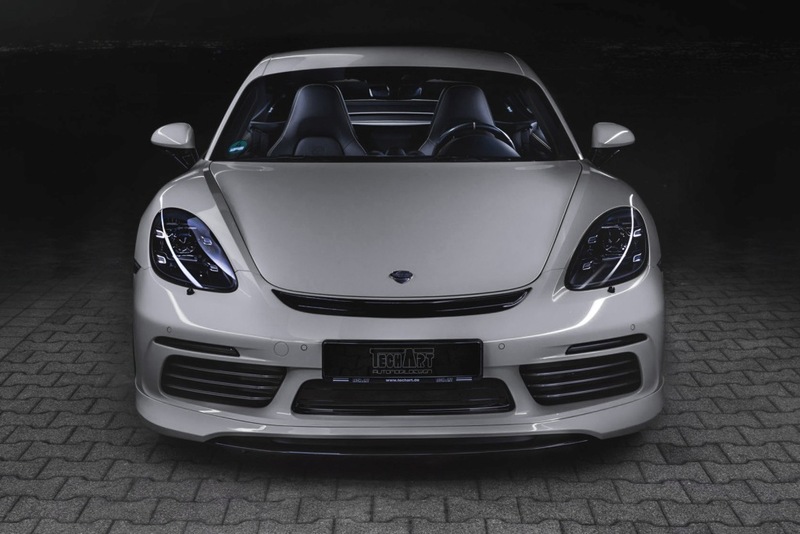 Porsche owners around the globe appreciate the unsurpassed accurateness and craftsmanship of the TECHART manufactory processing select materials such as carbon fiber, leather hides, Alcantara® or lacquered surfaces. Whether customers decide to set accentuating highlights or prefer a full individual treatment of their 718 interior, TECHART sets no limits to real individuality and exclusiveness. 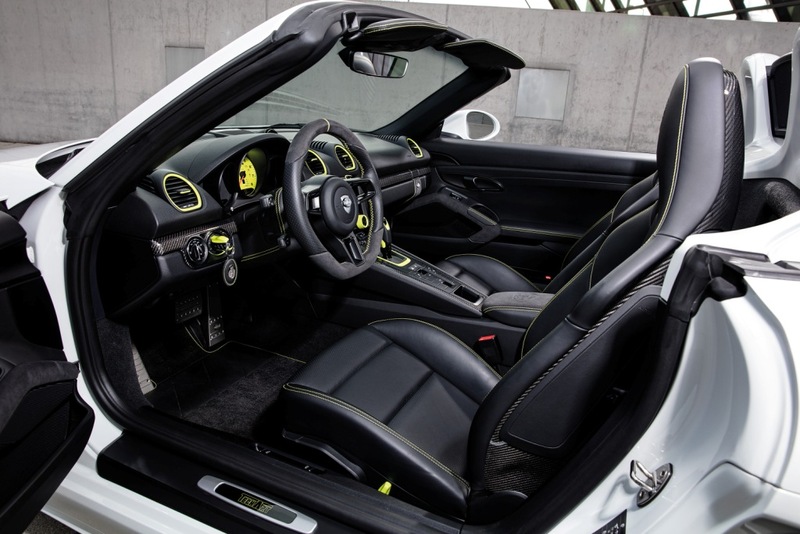 The TECHART interior program is completed by details such as color matched instrument dials, aliminium sport pedals, illuminated personalized door entry guards and more. A TECHART signature feature for the 718: the TECHART »Type 7« sport steering wheel. Composed by select materials and perfected design, every stage of production requires an extraordinary level of quality and accuracy. This is why still today all genuine TECHART steering wheels are handmade at the in-house leathershop in Leonberg/Germany. Reduced in diameter (360 mm) and ergonomically designed, it does not only catch your eye. The combination of painted surfaces, leather and Alcantara® segments as well as carbon fiber trims, matching pipings, stitchings and perforations creates an endless variety of options to be at your service. Needless to say that your standard features such as multi function, paddle shifts or steering wheel heating are maintained. 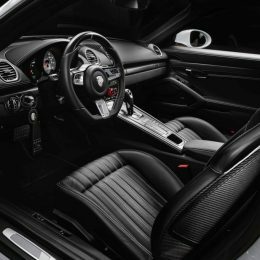 Sportive carbon fiber refines the steering wheel but also interior trims, the center console, door handles and the seat backpanels (Sport Seats Plus). 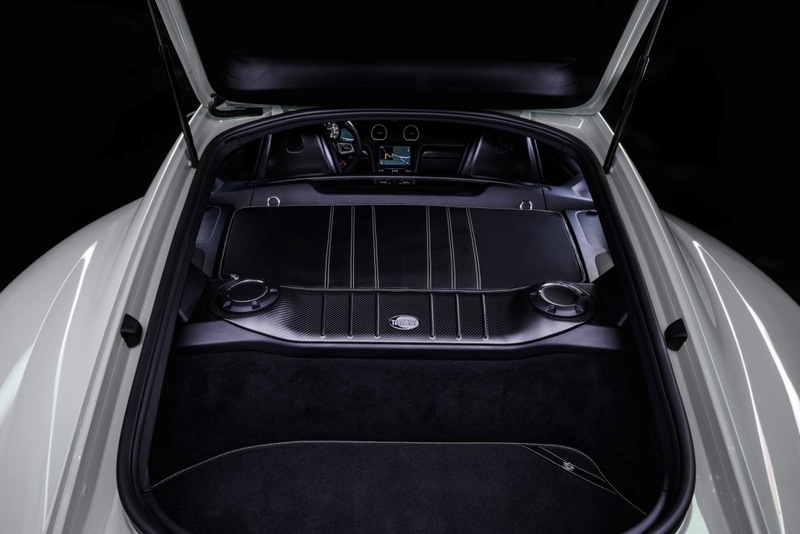 Exclusively available for the Porsche 718 Cayman: carbon fiber elements at the luggage compartment bar and the engine cover. A subtle highlight indicating the driver’s individuality, visible through the 718 Cayman’s rear window.